Thanks to Karen Volpe (and Amy Jo Eulberg, not pictured) for the opportunity to share my colorful work with Urban Acupuncture’s clients! Had a great time at the March 29th opening of my exhibit at Urban Acupuncture! Despite the rainy night, we had many friends stop by to see my Spring-inspired, new work. The show will hang through May, but due to the Center’s treatment schedule might prove difficult to see as a walk-in! Here are some shots from the opening…special shout out to Chef Brooke from Bleu & Fig!! She whipped up some great appetizer platters and goodies at the last minute for me- delicious is all I can say!!! This is only half of the goodies by Bleu & Fig Catering! Join me in kicking off an exhibit of my new paintings which will hang for the months of April & May! 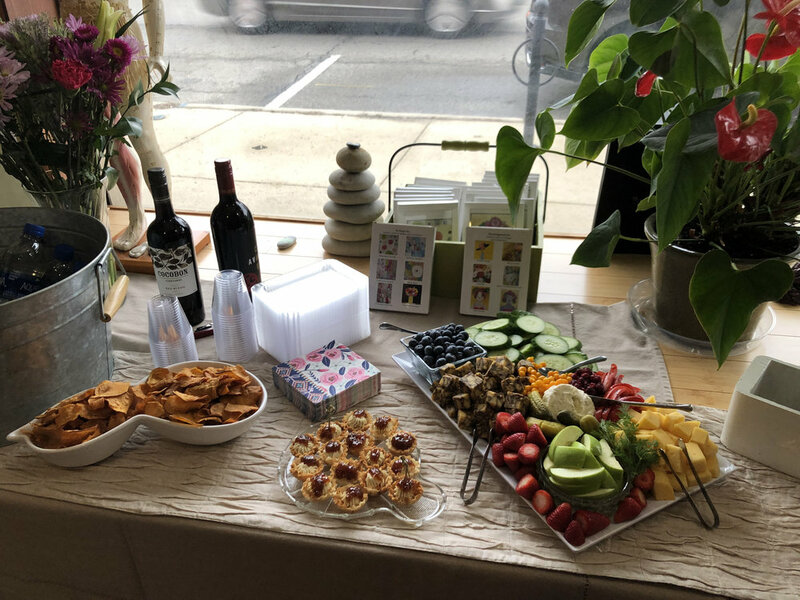 In order to respect Urban Acupuncture’s busy treatment schedule, best and easiest time to see the work is at the opening reception, so be sure to drop by for a drink and a peek!! Street parking and nearby Kroger parking lot available! Saturday, February 9th, I had the pleasure of teaching an art collage workshop with eleven women who are currently battling or have somehow been affected by cancer. In our three hour workshop, we shared art supplies, stories, encouragement and chocolate! I believe the day’s 3 greatest takeaways were (1) that art is therapeutic and can calm and soothe stress (2) it is important to take time, schedule whatever time one can afford in their day, to sit and be creative and (3) color can be powerful in enhancing one’s mood! I encourage everyone to tap into their own creativity! It can be as simple as doodling on a scrap piece of paper, but I highly recommend taking it further, and add color! May 2019 bring you and yours many blessings of health, success, peace, joy and of course…COLOR! This is one of the Ohio Art League’s oldest exhibitions, where all works accepted can not exceed 6” x 6”! So join us for Great Fun and Small Art! This is a cozy lil' coffee shop in the heart of Old Worthington, just south of the town square. Stop on in for a caffeinated treat and some lil' paintings and collages...the perfect gift for your kid's dorm room, that empty niche in your home or just a happy gift of color for a friend! I hope you'll stop by so we can chat! I can't wait to connect with you! Currently playing with alcohol inks and their reaction when applied to acrylic...the results are so bold and amazing! Some of these combinations will be in my upcoming show at Highline Coffee, in Worthington, Ohio opening Saturday, September 8th, 2-4pm.! New Work Hanging in Worthington!! I have new paintings and collages hanging in Worthington's Varckette Family Chiropractic offices, 870 High Street, Ste 104, Worthington , OH. Even if you are not a patient, but find yourself in Worthington, pop on in to their offices and ask to take a peek! All are available for sale- just contact me directly! 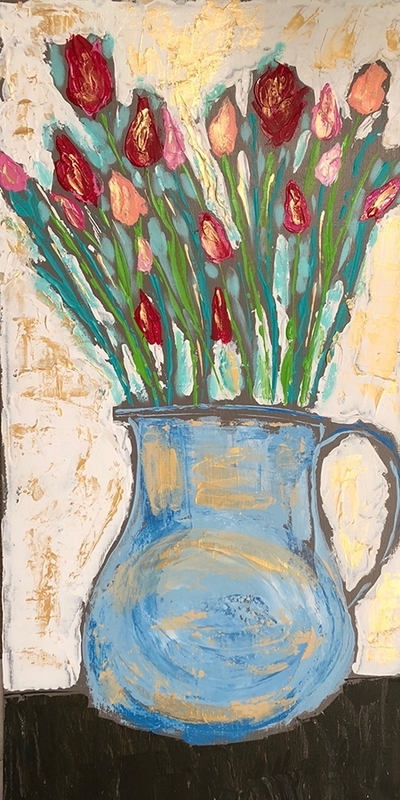 "Pitcher of Spring", acrylic on canvas, palette knife painted, 15" x 30"
Spring Brings Snowflakes, Blossoms and More Art! I'm working in this style lately...and will creating more like this one (which is spoken for) and will be hanging a variety of panels and canvases on May 5th, at the Varckette Family Chiropractic Office (870 High Street, Ste 104) in Worthington, Ohio. Boxed Greeting cards will also be available onsite for the month! Even if your back doesn't hurt- pop in and take a peek! Panel Discussion at the Works! Saturday, April 21st, I had the opportunity to join fellow Pen Women, (from L to R)Brenda Laymen, Renate Fackler and Rosalie Unger in an Artists & Writer's Panel Discussion, where we shared our writing and artistic processes and discussed our collaborative work that will remain on exhibition at The Works, in Newark, through July. 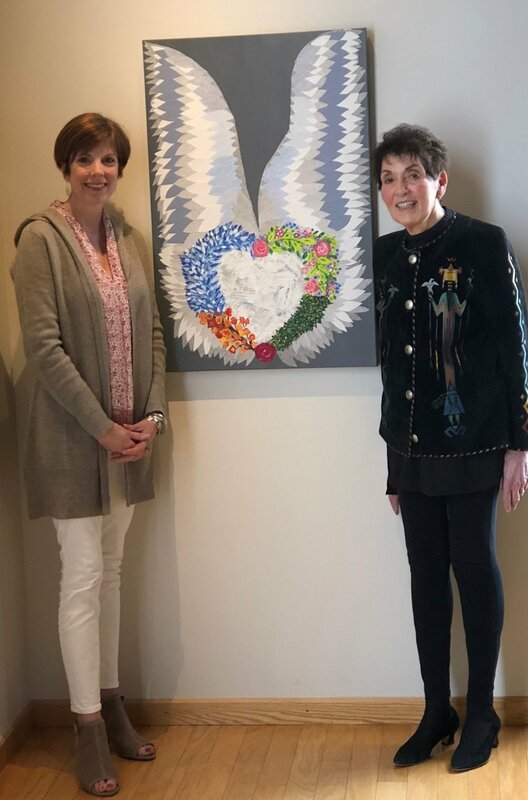 Rosalie Unger and I showcase our collaboration, "Guardian Angels", acrylic and paper collage with security envelopes and both of our prescription inserts! My additional piece, "Bald is Beautiful", Acrylic and paper collage on canvas with security envelopes and my prescription inserts; Rosalie's piece showcasing her published book, collaged with editor's edits! Join us for the opening reception at The Works (Ohio Center for History, Art & Technology), 55 S. 1st Street, Newark, Ohio 43055. As an organization comprised of professional women writers, artists, musicians, singers, dancers and choreographers (to name a few), we have had our "Women of Letters" and "Women of Art" members collaborate on this exhibit. Here's what I am finding...their colors are as bold as I was warned...loving that! They are similar to watercolor in terms of control, but they also lend themselves nicely to "happy mistakes"! They don't play well with gloss medium if they are being painted over, as they can bleed into the gel medium (even after they are dry) but they will happily sit atop of dried gloss medium! I'm currently working on a series of 12" x 12" panels that combine acrylics with alcohol inks. So far I'm pleased with the results...happy mistakes and all! What do you think? "You've Got This! Acrylic and alcohol inks on wood, 12" x 12"
These pieces are currently available, if interested, contact me directly for details! 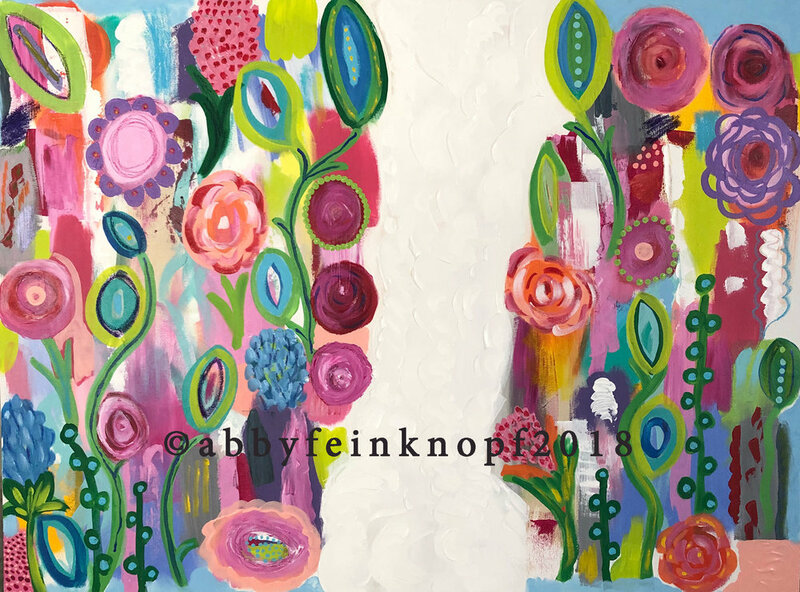 "Poppies", Acrylic and alcohol inks on wood, 12" x 12"
New greeting cards featuring Spring-like colors and designs will be available at the Columbus Museum of Art store this week...so be sure to stop in and get your color fix! "Garden Path", Acrylic on canvas, 30x 40"
Please join me for the opening of my exhibit at Copious, on Wednesday, March 7th, from 5-8p! Hanging throughout the restaurant, you will find my fabric collages, acrylic and paper collages as well as my latest bold acrylic paintings! There will be a lot of color to take in- I hope you'll also participate in the restaurant's wine tasting ($5) or better yet, make a reservation and stay for dinner! The more the merrier, so please join me and bring your family and friends! My work will be hanging through the end of March! Bringing you more happy, bold color in the New Year! "Snowy Garden (small)" acrylic & paper collage on panel, 10 x 10"
Ok folks...we have arrived. We are there. You know...the month on the calendar, where the skies seem perpetually gray and the bitter temperatures outside only add to the dreary mood! Personally, I fight back with a lot of bold, bright color and like taking a multivitamin, I have to take in color every day. So, I have been painting daily and some of my new work, seen here (in this blog post and my website's illustration gallery) will be available soon as more boxed sets of greeting cards! I will be sure to let you know when they are hot off the press and available, so subscribe to my blog or check back to my Facebook page! In the mean time, surround yourself with color, stay safe, warm and HAPPY! With the holidays upon us and 2017 coming to a close, I wanted to wish everyone a restorative, peaceful, holiday season! Thank you all for following me on facebook and instagram and please know I count you followers among my many blessings! Many have asked what is ahead...well, currently my boxed greeting cards are available through the Columbus Museum of Art store (and of course through me directly as I am working on getting my website's ecommerce section up and running). So in the mean time if you see something you'd like to purchase or commission me for, just email, pm me or the good ol' phone call will work too! I have been painting a lot and so you can look for more blasts of color from me in the weeks and months ahead! I am still accepting commissions and will have some surprises for you in the near future!